Apple has touted the fourth-generation Apple iPad as being twice as fast as the previous model. 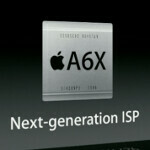 At the heart of that claim is the A6X chip which is 30% larger than the A6 inside the Apple iPhone 5. To illustrate the difference, the GFlops score for the newer iPad at 300MHz doubled to 76.8 the 38.4 scored by the third-generation model. GFlops is a unit of computing capacity representing 1 billion floating point operations per second. So what did Apple do with that extra space it added to the A6? It went to an extra graphics processing core of which there are now 4 on the chip, up from the 3 on the A6. 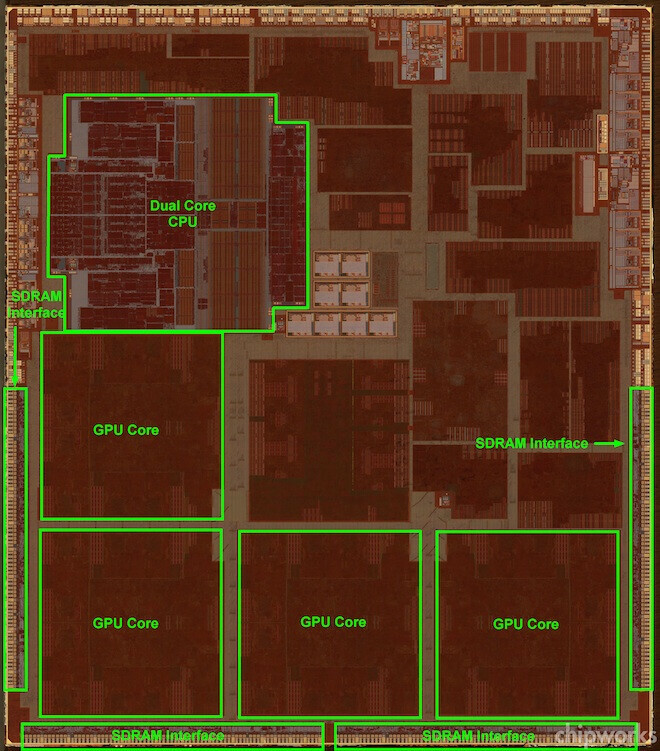 While the CPU size remains the same on the two, the GPU cores are larger on the A6X. Not only that, but when looked at through a microscope, the 4 GPU cores are divided into 9 sub-cores, two sets of 4 and 1 central sub-core. One analyst says this could be done for better parallel processing, or for a faster clock speed. Either way, he says that graphic speed will be blazing on the fourth-generation iPad thanks to the PowerVR SGX 554 GPU in the A6X. The chip also has double the SDRAM interface of the A6. All together, it sounds like Apple has really beefed up its full-sized tablet in time for the holiday shopping season. still prefer the nexus 10!! ok so the Ipad 4 has that...SO??! iPad doesn't have 300ppi on it's screen now does it? STOP MAKING ME JELOUS JUST CUZ I OWN AN APPLE IPAD 3!!!!!!!!!!!!!!!!!!!!!!!!!! I perfer games on iOS devices anyways. Developers seem to favor the fact that they are only developing for a set number of devices. Very few games are properly optimized for my Android phone :(. I think that iDevices are better "toys" and Androids are better actual (overall) devices.... but sometimes a toy is good. I don't find any need for an iPad, I'd (rather) buy a laptop with a nice GFX card for the same price.... and play real games. its true that at that price, you can get a laptop with more performance. However, its also true that software development on the Ipad can be more tailored to and designed around its hardware, to be more efficient. Thus a game like Infinity Blade Dungeons for instance can pump out some great graphics that are close to console quality and do so with great framerates an resolutions. A laptop in the $500 price range may be able to decently handle games, and if optimized well can even do better than the ipad in some games, but some games will be terribly optimized for that hardware and cause you to dumb down the settings, suffer framerate drops, etc. the game experience on a $500 Ipad will definitely be more consistent than a $500 laptop. I agree. I've played Infinity Blade and I've have to say, it does look very nice. BUT! That game is really boring. All you do is swipe across the screen a thousand times and press the "magic" buttons when they light up. I (personally) didn't like it that much. But it is still a very nice game. Not necessarily. If you have 4.x, apps look much better with the refined UI. I'd say that Android has most of the important apps, but I tend to stay away from the big developers. I perfer to get apps made by smaller developers and support them. Much like supporting small business compared to large corporations. but... that's just me. That's make raw performance lovers who bought the older new iPad get mad lol! it's true, i don't know why you got so many thumbs down for that. Qualcomm's Adreno 320 graphics only rivals the PVR SGX543(MP4) which has been out for a year now. It only has so many thumbs downs because it's apple related and everyone in phone arena is biased towards apple. You must be new here :P Either way, I agree that it is true. Even the Nexus 10 with the mali 604 can't really keep up with the powervr based on reviews. Don't get me wrong it is still powerful, but in real life tests, the powervr does better. That's not to say the iPad is a better tablet, just better at gaming, which everyone has to admit is true. I'm not being biased here since I'd get the nexus 10 over the iPad 3rd generation and just maybe over the 4th generation, especially with the widget support and incredible screen, but the iPad is better at gaming. I see myself getting dislikes cause I said something good but true about apple that does not involve marketing or the ability to sue. hes not new here, Kingkurogii has been posting for years+. i've been around for a long time actually and the majority of commenters from this site are definitely more biased towards Android. you're either the one that's new here or you don't come here often. xD it's true, the iPad is more ideal for gaming. i'd still get a Nexus 10 for sure though. My bad, I just realised I said biased towards apple xD And I was just kidding about calling you a newbie, and I've been visiting phonearena everyday for a few months, so I'm still new here, but the hate towards apple is unmistakable. It's sometimes even unreasonable, Apple doesn't make the worlds crappiest products. The iPhone 5 is still a great phone, just not as much of a game changer as the iPhone 4 or the original iPhone. It still has apps and games, a great screen and a beautiful design. The iPad mini is a joke, I'm sorry but apple is conforming, which is bad for a company that "thinks different" and asks you to do the same. I do adore the new iPad and the new New iPad. oh, yeah, the strongest feelings around here are definitely for Apple. i love Apple's hardware. i don't like how repetitive they are but they design beautiful, powerful products. in fact until i felt the Droid Razr MAXX HD the iPhone 5 had the most impressive construction of any phone i've ever felt but iOS is just too terribly stale now, it's completely unforgivable and they've made a lot of very questionable decisions over the past few years and they totally screwed up the iPad Mini. they don't learn anything from their competition. Here's hoping Sir Jony Ive fixes iOS. yeah and it's two and a half years old. the SGX540 in the Razr is just a highly clocked single core GPU. it's still not even a bad GPU. So this just means Apple will start releasing Ipads more then once a year just to keep up with Android tablets. But next month something will come out even better. Even if Apple owns alot more tablet market, when you look at the nexus tablet, it can't be beat with quality and price.